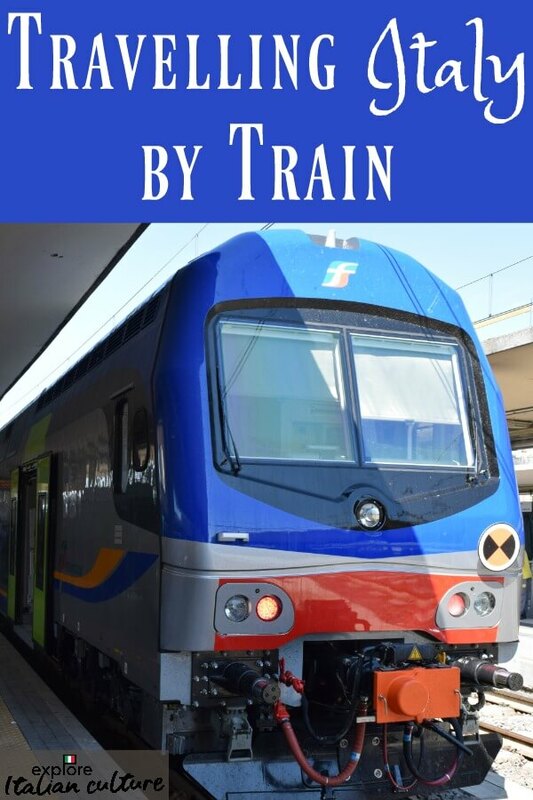 12 Tips for easy, safe travel by train in Italy. 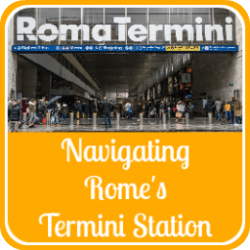 How to travel by train in Italy: 12 tips for using the Italian rail system with confidence. Want to get out of the main tourist areas and see the beautiful Italian countryside? The answer - go by train! 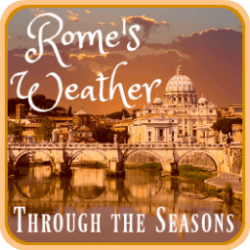 So you're in Rome or Venice and you'd like to get outside the city and see something of the country? Or you're planning a trip to various parts of Italy and you don't want to drive? (Good call!). Let the train take the strain! Be a traveller, not a tourist - travel like an Italian! Like many Italian people, we travel by train in Italy all the time. They're clean, spacious, inexpensive - especially if you book in advance - and they mostly run on time. Some of them even give you free soft drinks and snacks to make the journey pass more pleasantly. And while you're waiting you can enjoy the stunning architecture - and great coffee bars - of many of the stations. The benefits for you as a traveller are obvious. You'll leave when you expect to leave and get to where you want to go quickly. You'll be comfortable and, if you want it, you'll have the company of your dog and your bike. And best of all are your Italian co-travellers, who like nothing better than to share a good chat with people from other countries - even if they don't speak your language. The downsides? The train won't wait if you're late, and because of their popularity the cheaper seats sell out very quickly. Leave it till the last minute and you could find yourself having to pay a business or first class rate at a price three or four times that of a pre-booked ticket. How to use this page. There's a lot of information here, all based on our own experience of using trains in Italy extensively. That makes this a long page. Tip #1: Buying tickets online. As soon as you know what your planned dates are - book! The best fares sell out very quickly - on popular routes often within hours of going live. 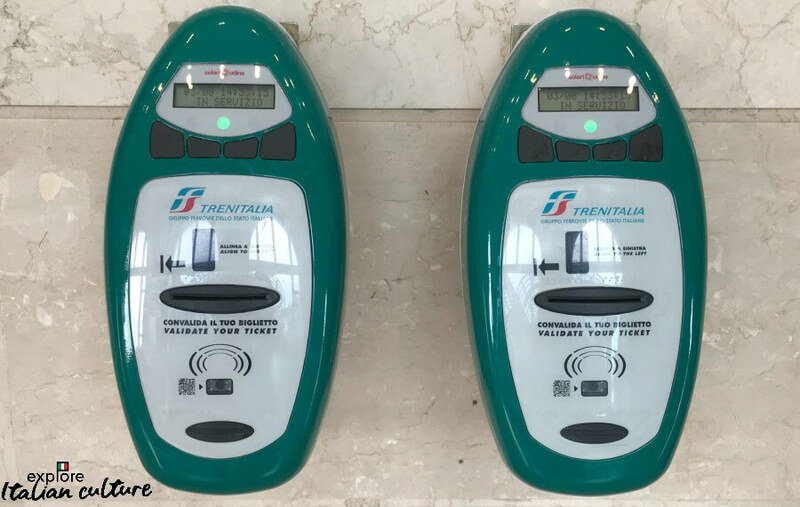 The easiest and most inexpensive way to do that is online at the TrenItalia website - this link goes to the English version. If you find your dates aren't yet live, diary a time to return frequently. Seat prices are released about 3 months before the date of travel - but this can vary wildly. So keep an eye on it. Italians love travelling by train and the entire train can be booked up if you leave it too late. Seriously! Enter your start and ending destinations, date and preferred time of travel and number of passengers and wait for it to spit out all the possible "solutions" for you. Top Tip: If you want to book a train earlier in the morning than those you see being offered, enter the date of the day before you want to travel. Scroll to the bottom of that list and you'll see the early trains for the following day, marked with a *. Why? We have no idea - it's just the way it is. On some trains you'll be offered the option of booking a seat. Do it. It doesn't cost any extra and can save you long journeys standing in corridors. Some journeys, notably on fast trains between the larger cities, require you to book a seat anyway. High speed trains like this Frecciargento require you to book a seat. Make your choice, pay with a card and print out your vouchers. No need to have them pre-stamped at the station. Tip #2: Buying tickets at the station. Of course it's possible to buy tickets at the station, too. It's easily done by the 'Fast Ticket' machines you'll see in all the larger stations, or in the ticket offices. Use the ticket office if you're not sure about times, or in smaller towns where there are no machines. On the machines, payment can be made using cash, or international credit or debit card. The machines are very straightforward to use and operate in a variety of languages. Look out for the ticket machines - simple to use and in multi-languages. Top Tip: The drawback of not booking in advance is that you will find the less expensive seats are sold out, particularly if you're travelling between cities and / or at weekends. Sundays are especially busy times as people travel back from the seaside, or from their family towns to their places of work. You then have a choice to pay the full economy, business or first class rates which will be far more expensive. Or you can travel on a slower train, or at a different time. But once the seats are all sold that's it - there's no overcrowding here! Top Tip: Children, students and pensioners can all travel at a reduced rate. Look out for these at the time you book. Don't try to claim a concession to which you're not entitled. 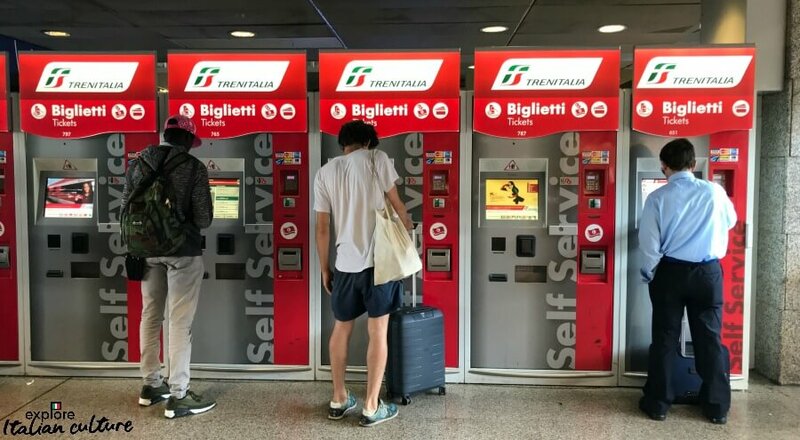 There's a very tight inspection system on trains in Italy and you may well be asked to provide proof of age or to show your student card either when you book or on the train. Fines for improper use are steep. The type of "class" you travel will largely depend on the train you book. Local trains in Italy don't have different classes - the seats are all the same, and there's no food or drink served. Some routes still have carriage trains where there are six places in each compartment with a corridor running between them. That type of train, though, is becoming increasingly rare as Italy is constantly upgrading and modernising its stock. 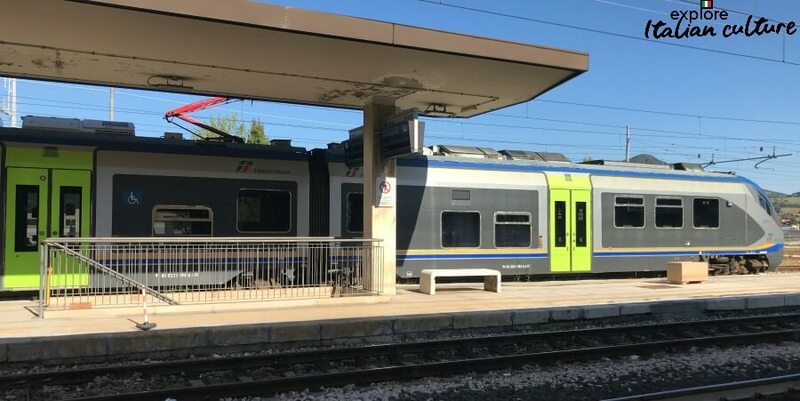 Local trains in Italy are becoming modernised over time. Like many other countries, inter-city trains, including the Eurostar, are split into economy, business and 1st class. The difference between them is what you'd expect : seats are slightly wider, they're not generally as crowded, they're quieter and you can choose to travel in a 'quiet compartment' on some business class trains. There's also free wifi access on some (but not all) routes, and you'll get more individualised treatment, including a good selection of free soft drinks and snacks. For more information about the different types of train and what they offer, see this page. Top Tip: To get 1st class tickets at the cheapest rate, book seats as soon as they're released - generally about four months before the date of travel. Tip #5 : At the station - finding the right train. 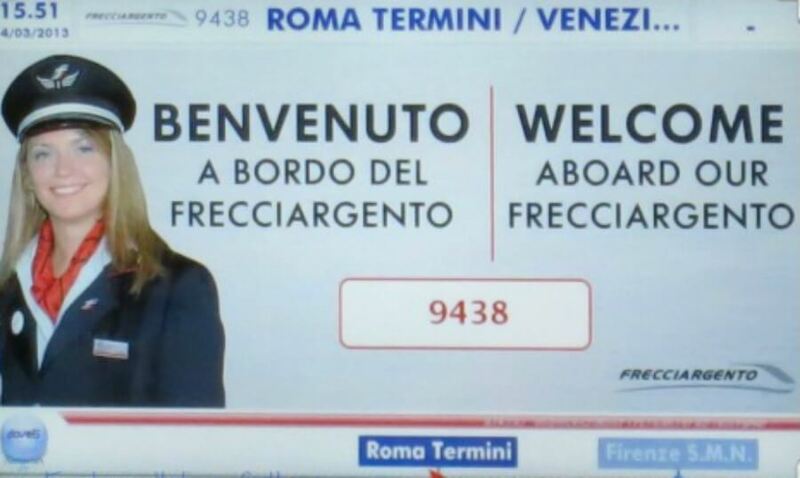 Top Tip: All trains in Italy have a number. You'll find it on your voucher or ticket, and you need to look for the corresponding number on the departures board. Don't just look for your destination name and assume that's your train. Quite often trains will leave within minutes of each other for the same destination, or for different stations within the same city. See how several trains leave at almost the same time for Napoli? So look for the correct train number in the second column. 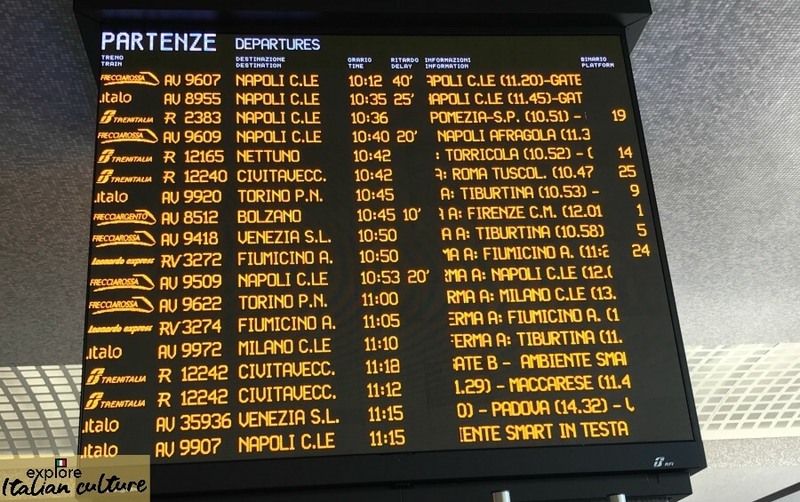 Once you find your train's number on the notice board look for the platform number to the right of the destination - most notice boards, certainly in larger cities, are now in English as well as Italian. If not, find the word "binario" which means platform. The platform number is often not notified until very shortly before the train is due to leave, particularly if you're joining at a destination in the middle of a long journey. If you're boarding at the start of the journey or at a smaller station, the platform will be on the timetable notice board which may be electronic or, in the case of small stations, is usually to be found as a noticeboard near the station entrance and on platforms. Finally, information about the number of the train, its final destination and when it's due is to be found on the platform itself. Look out for the black sign at the start or in the middle of the platform. Tip #6: Validate your ticket! If you've bought a ticket online, this doesn't apply to you. You'll just need to show your voucher to the inspector on board. It doesn't apply, either, to tickets for the fast trains with pre-booked seats. Those are valid for one train only. But if you have a ticket for a local or regional train bought at the station, you must make sure you validate it before you get on the train. You'll find machines like this in every station and at the start of platforms. Top Tip: Not validating tickets can result in a heavy fine - and being a tourist will not be accepted as an explanation! Make absolutely sure you validate before you travel! Tip #7: Carrying luggage on trains in Italy. You can travel with as much luggage as you like on Italian trains. There are no restrictions on weight or number of cases - except how much you can physically carry! There are left luggage counters at all major stations although the process of checking bags in and out can be long and tiresome. Allow plenty of time. 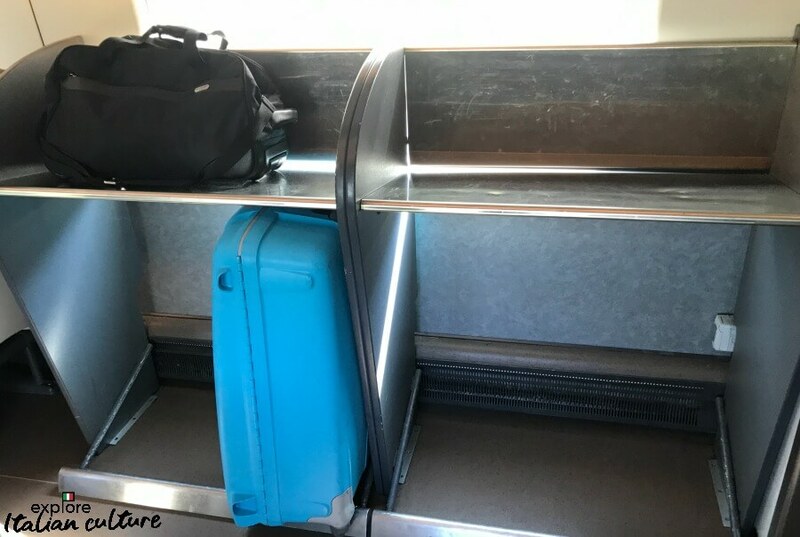 There's no extra charge for carrying luggage on trains, but nor are there any separate luggage compartments - your luggage travels with you in your carriage. On larger trains you'll find space for the luggage on racks at either end of every carriage. Don't worry about leaving it unguarded - thefts are really extremely rare. If you'd prefer, most trains also have luggage racks both above and between seats. You won't fit large suitcases there but smaller, hand luggage size will fit in very easily. If your case doesn't fit there and there's no space for it elsewhere, just keep it in the aisle next to you. Everyone does! Many trains in Italy are a long way off the ground! We've found the best way of getting all our luggage safely on board is for one person to climb on while the other stays on the platform to hand the luggage up. If you're travelling alone you'll find that other people are very willing to help. Tip #8: Welcome on board - now find your seat! 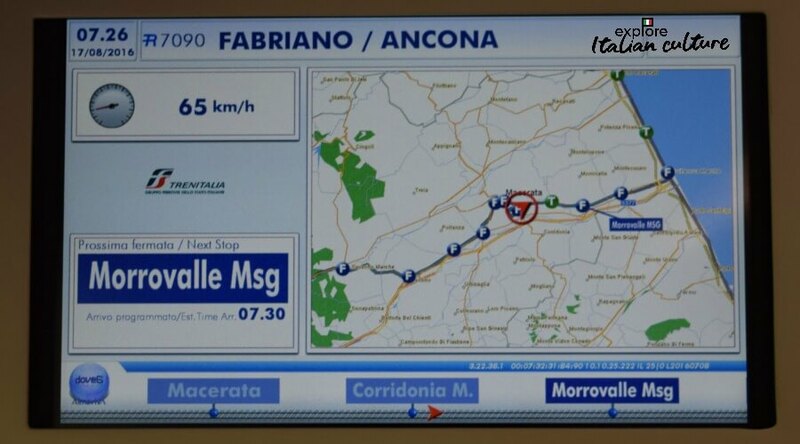 Welcome on board - the Frecciargento high speed train from Rome to Venice. This can often be a bit of a hit and miss affair. If you've booked online you'll find the seats you chose are the ones showing on your voucher. Booking at a station, however, is not as reliable and although you'll be asked which seats you would like to choose, you won't necessarily find those same numbers on your ticket, particularly if the train is nearly full. The machine gives out whichever seats it knows are available and they won't necessarily be next to each other. We've even had seats allocated two carriages apart! Another good reason to book online. Check your voucher or ticket for the carriage number and seat allocated. This ticket shows carriage (Carrozza) 3, seat number (Posti) 5D - a window (Finestrino) seat. Once you've found your carriage and seat, you may well find someone else sitting in it - sometimes because people are confused about the numbers, sometimes because of an innate dislike of being told what to do and where to sit! You can, of course, insist that whoever is in your seat leaves it - after all, everyone will have an allocated number. The flip side of the 'I'm not being told where to sit' story is that if you have seats apart, more often than not an Italian traveller will vacate the seat you would really like and go to sit in the one you were allocated. 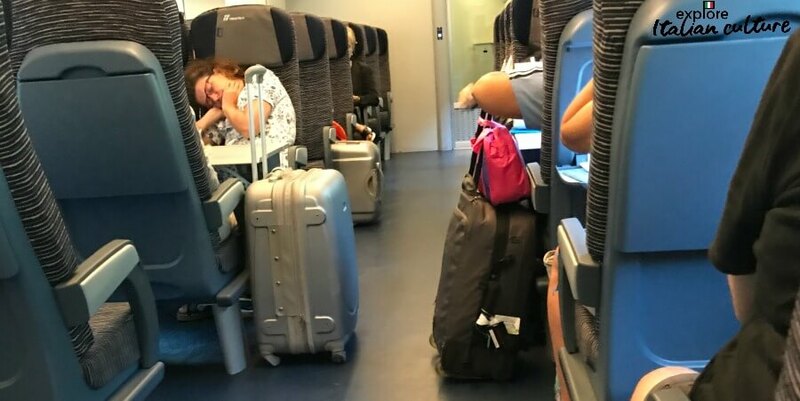 We've been on a number of journeys where this has happened so although our seats were miles apart, accommodating Italians have let us sit together and wandered off in search of our seats. The one exception to this 'musical chairs' game is the Eurostar. For some reason people travelling by Eurostar tend to stick with their own places, and expect other people to do the same. Tip #9: On board information. Even on smaller, local trains in Italy, you'll find constant information about your trip relayed on monitors above your head - speed, name of next station, time of arrival, even what the weather's like! Detailed information even on one of our little local trains. Some older local trains don't have the same luxury. On those, you'll need to make a note of which station is the one before yours, and how long between that station and your own so that you're ready to begin getting your belongings together in time to get off. Top Tip: Try using an app like Google maps - add your starting point and destination and choose public transport option. It shows exactly where you are as you move along the journey. If you don't have access to a mobile device while you're travelling and you're not sure when your station is, do it the old fashioned way - ask. People are always very willing to help. Tip #10: Food and drink. Again there's a difference here between the different types of train. Large, inter city trains will have a buffet serving typical train fayre - sandwiches, coffee and so on. Some also have a trolley service with soft drinks and snacks and on the main routes, travelling premium class (ie business or first) you'll be offered a free drink and nibbles. Local trains don't have that luxury. If you're going on a longer journey expect your Italian traveller friends to offer you some of their home made picnic - otherwise, buy sandwiches and drinks before you board. 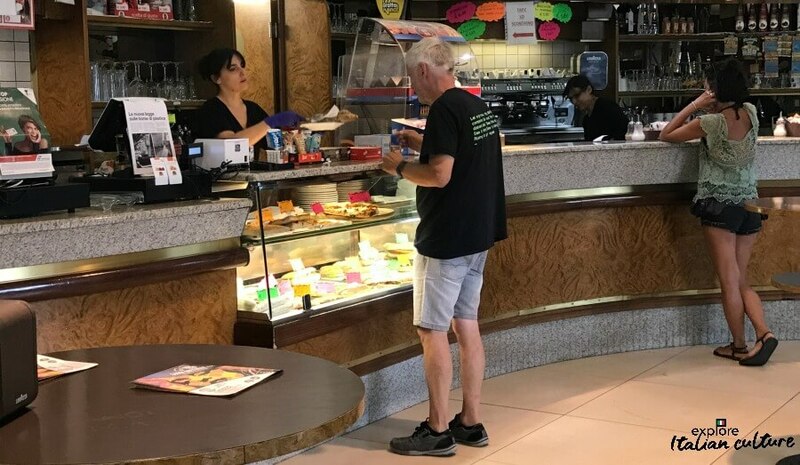 Mike buying breakfast at Foligno - one of our favourite train station bars. Top Tip: All but the very tiny rural stations have platform buffets where you can buy food and drink before you travel or to take with you. The food tends to be excellent. Leave plenty of time to buy, because queues are often long - particularly during rush hour. Tip #11: Travellers with reduced mobility. Travel for disabled people on trains in Italy is very hit and miss. The train system is extensive and parts of it, very old. Station platforms tend to be low down and train entrances, high up. It's not ideal, but it's improving and there are always staff on hand at stations to assist. 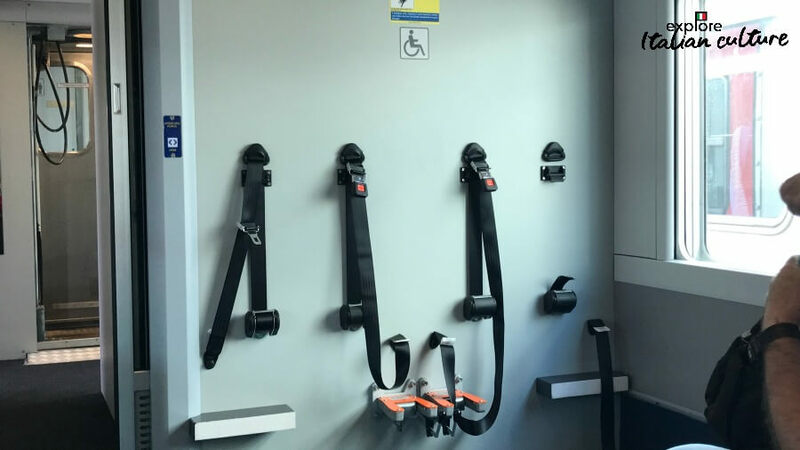 New stock is being introduced with mobility issues in mind and even some smaller, local trains now have designated places for wheelchairs, including adjacent seats for carers. The best point of contact for anyone requiring help with reduced mobility - defined as "physical, sensory or motor impairment" is the "Sala Blu" (Blue Room) at larger stations. Top Tip: It's a good idea to contact Sala Blu staff at least 24 hours before your train is due to depart to check the mobility access at the stations you're travelling to and from. You also need to arrive at the Sala Blu at least 30 minutes before departure so that employees can help with platform and train access. 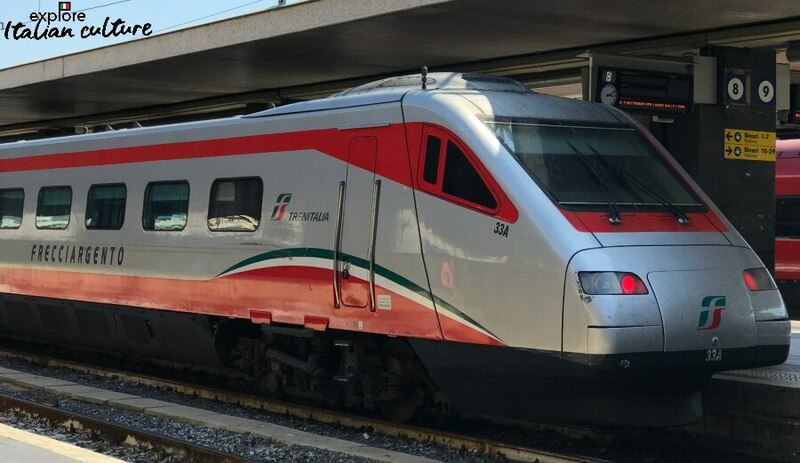 For more information about Tren Italia services for passengers with reduced mobility who aren't able to get to the station before travel, see this page (in English). Tip #12: Travelling with dogs. Trains, like most places in Italy, are very dog-friendly. Dogs can travel with you but they must be microchipped and immunised, and you must carry with you the 'pet passport' or, in the case of Italian dogs, the dog registration certificate. Failure to be able to produce this can mean you're asked to leave the train at the next stop. One small dog per person can be carried in a pet carrier or as part of your luggage in a bag free of charge. No one is phased when a tiny dog pokes its head out - and it's often the start of a long and friendly conversation about dogs in general. Small dogs must travel in a carrier - whether they want to or not! 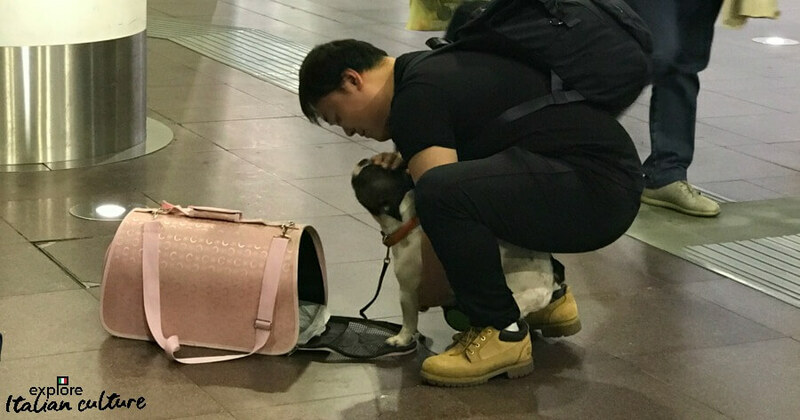 Large dogs which can't fit into a carrier can also travel by train and are allowed to sit with you, but by law they should be muzzled and on a leash. They must also be in possession of a ticket! - which costs half the price of an ordinary adult ticket. Service dogs of any size can be carried on trains in Italy at no cost. Buon Viaggio! - Have a good trip! 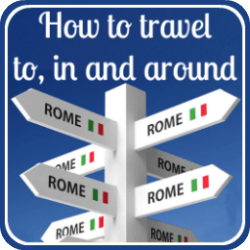 Want to know more about travelling in Italy? Click on the pics!